Our stylish storage baskets are suitable for storing clothing, toys, dry food, in the wardrobe, on the shelf or in living room, bedroom, laundry room, kids' room and kitchen. Cube Storage Bins provide a simple and fashionable solution to today's office, home, or dorm space and storage needs. Tidy room needs you spend time and storage basket to sort out. Timing storage and clean up can enhance happiness. ★ Fashionable Design - Designed to match interior decor and style in any room in the home or office. Enjoy the relaxing ambiance of the soft blue and natural white neutral color scheme. Fresh navy style, a vintage pattern - this also can be a decoration in your house, blend in with your room. Convenient and useful drawstring closure for dust-proof. 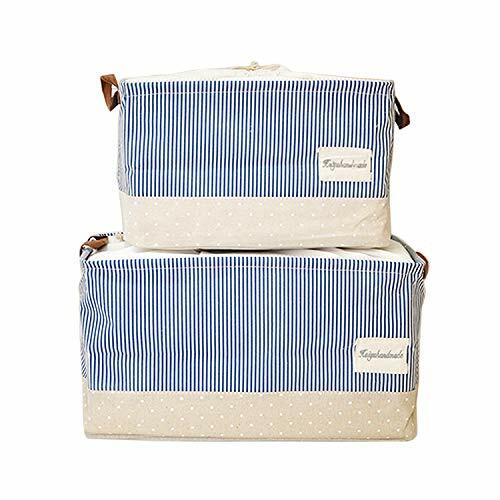 ★ Multi-function - Utilize as waterproof closet organizer bins, clothes baskets, baby room toy storage, laundry storage, cat & dog toy storage, book and magazine organizer, file organizer, bathroom towel and toilet storage, and many other uses. You can storage something that's not used for the time being, and we offer 2 different size Storage Boxes. ★ Extra Storage Space - Fabric storage bins set will meet your various storage needs via providing you extra storage space and well organize the clutter. Collapsible foldable storage bins, very lightweight and easy to carry away. ★ Space Saving Storage Box - Sturdy side design makes these stackable storage bins which will take full advantage of your closet shelf, and also can be folded flat to save space when not in use. If you have children or keep a pet, you really need our caring storage basket so you can tidy up their numberless toys. ★ 2 Pack Large storage baskets, large capacity storage. this storage bins set will meet your long term storage needs. 100% cotton with PE coating inside for waterproof. The Bigger one is: 18.8*12.9*10.6 inches. (L*W*H) and the other :15*10*8.6 inches.(L*W*H). Two size for your choose. View More In Baskets & Liners. If you have any questions about this product by HUABEI, contact us by completing and submitting the form below. If you are looking for a specif part number, please include it with your message.